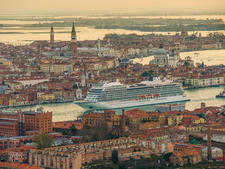 With its debut in 2018, Viking Orion became the fifth ship in Viking Ocean Cruises' rapidly growing fleet of nearly identical ships. With a capacity of 930 passengers, Orion is a small ship that's big on amenities designed for those looking for relaxation alongside their exploration. 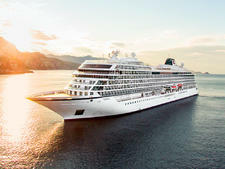 Viking Orion stands out as the first ship in the fleet to feature a high-tech planetarium. And it's fantastic. Passengers with even a passing interest in space will adore this brilliant element, which brings the stars and planets up close. The high-res 26-seat dome theater links to the ship's telescope and shows 3D programs that will make you feel like a kid again. The ship's ties to exploration have been around since its inception; it was even christened by astronaut Anna Fisher. (You'll see photos of space exploration everywhere onboard, further strengthening the theme.) The planetarium is a whiz-bang feature that grabs your attention, but it's certainly not the only thing that makes this beautiful ship so outstanding. The exceptional cabins are also a big draw. No matter which category you pick, you'll find yourself with plenty of space and amenities that make your voyage more comfortable -- things like heated floors and fog-free mirrors in the bathrooms, spacious balconies and a living area large enough that you'll actually enjoy spending time there. Then, there's the thermal suite, a part of the spa designed for relaxation, with a heavenly thalassotherapy pool, steam room and snow grotto. Viking's thermal suite is one of the best perks at sea because it's included in the cost of your cruise. The cruise line holds dear its no-nickel-and-diming policy, which makes Viking Orion an excellent value, with included dining even at the ship's specialty restaurants; wine, beer and soft drinks at lunch and dinner; and a shore excursion in each port. The quality and variety of dining on Viking Orion is top-notch, while included shore excursions are fairly standard, with few that stand out. Service in general also is notable, as crew members are friendly, helpful and efficient. The ship has Nordic roots, so it's no surprise it's decorated throughout in pure Scandinavian style, with light and bright woods and fabrics, shades of blue and clever use natural lighting everywhere. Dining, drinks and even the spa reflect Scandinavian tastes with goods (salmon and waffles, for example) and brands (from Norwegian craft beer to Swedish skin-care products). Viking Orion succeeds because of its attention to detail, which is evident in every space. The Living Room, the ship's main atrium area, is designed to feel like your living room; comfy chairs and tables fill the space, and these have hidden outlets and USB ports so you can charge your devices while reading a book or listening to the musician play. Details in spaces like the Wintergarden and the Explorers' Lounge reflect deeply personal tastes and memories from Viking Chairman Torstein Hagen and his family. Cruisers on Viking Orion tend to be 55 and older. They're often well-traveled and have the flexibility to take longer cruises, plus a desire to explore with like-minded travelers. Passengers under 18 aren't permitted to sail (and they likely wouldn't want to, given the atmosphere onboard is adult in nature, with activities and entertainment aimed squarely at baby boomers). Americans, Brits and Aussies make up the primary passenger base, and English is the language spoken onboard. Cruise Critic’s professional photographers and our extraordinary community members have taken 2,210 pictures of Viking Orion. When you visit our photo galleries, you can be assured that what you see is what you get. Passengers wear casual clothing during the day, when time is often dedicated to shore excursions. Almost anything goes, from jeans and T-shirts to summer dresses, shorts and capris. Poolside, swimsuits and cover-ups are the norm; swimming attire isn't worn in indoor spaces. At night, it's country club casual, with women wearing dresses or dress slacks or skirts with blouses, and men in trousers with button-down or collared shirts. Ties and jackets aren't required and are rare though not unheard of. Those preferring to keep it more casual can dine in the ship's buffet, the World Cafe, which doesn't have a dress code in the evening. There are no formal or elegant nights on Viking Orion. Viking Orion cruise fares include the basics like your cabin, all dining (even in the specialty restaurants) and entertainment. 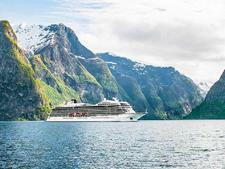 They also include a number of impressive add-on discretionary items that many cruise lines charge extra for, including Wi-Fi; self-serve laundry; one shore excursion in every port; and wine, soda and beer at lunch and dinner. 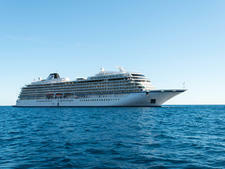 On Australia and New Zealand sailings, gratuities are also included. You'll pay extra for premium wines and spirits as well as beverages outside of lunch or dinner. The ship's Silver Spirits package is available for US$19.95 per person per day (including 15 percent gratuity); this covers any drink up to US$15, premium wines (and a premium pairing at The Chef's Table) and a 15 percent discount on beverages over US$50. Passengers are allowed to bring beverages -- alcoholic or otherwise -- onboard to drink as they please without paying a corkage fee. Tipping is not included in your fare (when cruising outside Australia and New Zealand), and Viking will charge US$15 per person, per day, to your shipboard account to cover gratuities for restaurant and hotel staff. If you wish to adjust your gratuity, you can do so at the guest services area. A 15 percent gratuity is added automatically to beverages purchased separately (not using the Silver Spirits drinks package). Tipping in the spa also isn't covered; you'll be given an option to tip when your service is complete and you are signing out. Also, tips for tour guides aren't included. Passengers wishing to tip guides and drivers can do so at the end of their tours, in cash. The onboard currency is the U.S. dollar. All-balcony ship carries 930 passengers and impresses with airy design, multiple dining venues and gorgeous pool deck; fares include wine with meals, Wi-Fi, tours, spa access. Refined, yet relaxed, with an emphasis on fine dining and long port days; highlights are free Wi-Fi, plus wine and beer at meals; holds about 1,000. Thoughtfully designed ship, with gorgeous pool and spa, carries 930 passengers on destination-focused cruises; fares include Wi-Fi, select shore tours and drinks with meals. 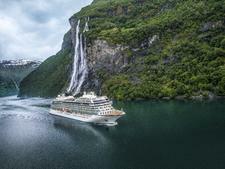 The 930-passenger Viking Sun, will spend its maiden season sailing Viking Ocean Cruises' first world cruise -- a 141-day itinerary visiting five continents.